Favoured by restaurants, albacore tuna is one of the most sought after fish around the world. Iasa have been working with tuna since 1980, which is now one of the company's most popular products. 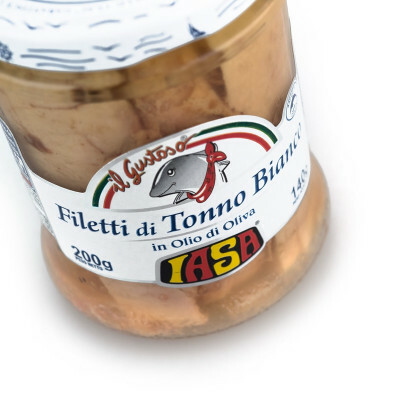 Caught tuna is sustainably caught from boats off the Amalfi Coast and is ready to be processed on site within a few hours, to ensure ultimate freshness and flavour. Carefully selected fish are then steamed and dried under vacuum to keep them as tender and flavourful as possible, with a luxurious silky texture. Albacore tuna (Thunnas alalunga) is one of the most sought after fish around the world, firm in texture with a rich, clean taste. 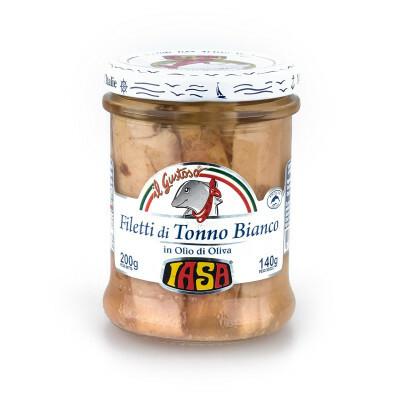 Also known as the white meat variety of tuna, it's thickly cut and packed into glass jars with premium Italian extra virgin olive oil. Hand-packing them in extra virgin olive oil not only guarantees a great, fresh taste, moist tenderness and authenticity, but also improves the tuna's health benefits. The nutrient-rich albacore tuna and the extra virgin olive oil impart their subtle flavours on one another, so be careful not to discard the oil. Perfect a top a Salade Nicoise or as part of an Antipasto Platter served with peppadew peppers. Or you can simply top the fillets with capers, chopped fresh herbs and a squeeze of lemon. Albacore tuna, olive oil, salt. FISH.